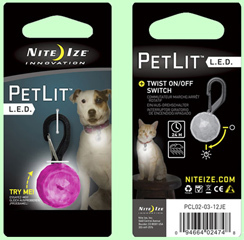 The Nite Ize PetLit LED Collar Light is a unique battery-powered LED that you can clip securely to your pet's collar, keeping him or her stylish and visible at all hours of the day and night. Made of durable plastic the bright LED light is easy to activate with a simple twist. It's a fun, yet reliable way to keep your furry friend safe and visible when you're out hiking, camping, running, walking, or playing in the park - and all other early morning or late evening romps.